There are two ways of legally running a waste business – with an environmental permit or with an exemption from having one. Unfortunately, some people choose to abuse the system, causing serious damage to the natural environment. It’s our job as Environment Agency officers to make sure they don’t get away with it. If a business creates or stores waste that could pollute the air, water or land, it is likely to need an environmental permit. A waste exemption can be obtained for certain types of waste storage or treatment, usually considered easily controlled and with a low risk of pollution. Examples where an exemption might be allowed include recovering central heating oil so that it can be reused, storing sludge at a place before it is spread, or treating certain types of waste to make it easier to transport. However, exemptions prescribe the limits of waste that can be managed – they are not a short cut to avoiding the fees attached to a permit. Find out more about the range of waste exemptions at GOV.UK. Our waste teams in Essex, Norfolk and Suffolk have been investigating a range of operators who have registered exemptions but been operating illegally. When our advice is ignored, and laws are broken, we will take tough action. Offenders often end up in court with large fines and the proceeds of their illegal actions are confiscated. 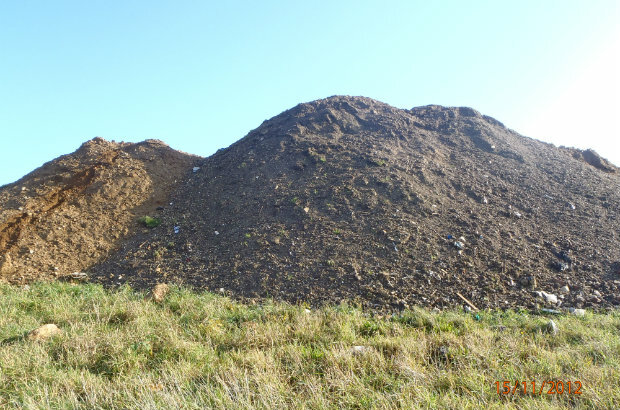 We found one such case where an exemption for ‘use of waste in construction’ had been registered, but the operator was running a full-scale inert waste transfer station at the back of a golf course. An exemption had been registered for the site, but it only allowed the use of suitable waste for small-scale construction. It did not allow the treatment of waste or the use of any contaminated soil, both of which were happening at the site. When we first visited the site we saw piles of various wastes which included soil, rubble, asphalt, and aggregate fines. We launched an investigation and found out that the magnitude of the operation was vast. Instead of the 5,000 tonnes of aggregate allowed, company records showed that 94,000 tonnes had been taken to the site. Our investigation was conducted through a combination of intelligence gathering and examination of waste paperwork. There was evidence the company had taken waste from a groundworks company, a contractor for two developers who were building at nearby sites, one of which required remediation due to historic soil contamination. We successfully prosecuted the company and the outcome of the sentencing was that the company was fined £30,000 and ordered to pay £20,000 costs. We also found that large sums of money had been made and we pursued them for Proceeds of the Crime – as a result the company had to hand over £247,000. Illegal waste sites undercut the legitimate waste trade and have the potential to harm the environment. It must not be tolerated. During the prosecution of the company, they applied for the relevant environmental permit that would allow them operate within the law. We have now granted this and the site is operating legally. Where we find breaches of the exemptions but no adverse impact on the environment, we approach operators and advise them of the need to apply for an environmental permit. We have had a number of successes on this front. When operators register an exemption, they need to understand and work within the limits of the exemption. If you suspect an operator is not acting legally, you can report it anonymously. Call Crimestoppers on 0800 555 111 or provide information online at www.crimestoppers-org.uk.